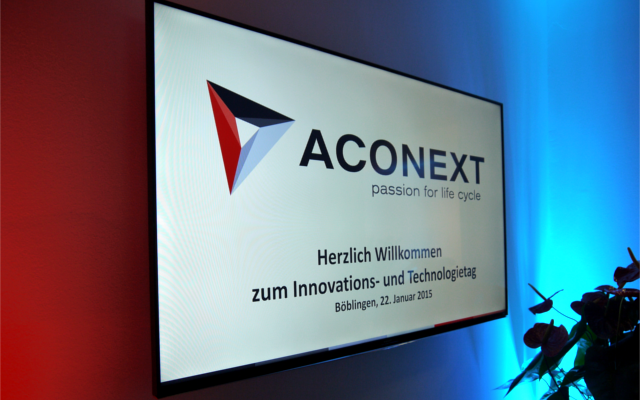 The new premises in Böblingen were officially presented as part of ACONEXT‘s Innovation and Technology Day. A successful opening event provided the ideal setting for interesting lectures and interaction between customers and employees. In addition to the talks given by Management and employees from the areas of Digital Consulting & Engineering, Electronic Engineering and After Sales, business associates, partners and employees could listen to lectures by prominent guest speakers. Heinz Simon Keil, an experienced strategy consultant at an international company, provided an insight into the future of value creation from the point of view of life cycle management in his talk. He also referred to the current topics Industry 4.0 and Design to Future in his remarks. A further prominent guest speaker was Alfred Katzenbach, the well-known automotive expert, who has made ground-breaking decisions in the field of PLM (Product Lifecycle Management) at Daimler AG over the last decades. In his contribution he discussed in a very visual way the growing importance of PLM systems and engineering collaboration in future. The modern, newly-equipped premises at the Böblinger Atrium office centre provided a perfect showcase for the event. The harmonious atmosphere invited the guests to continue networking and hold lively discussions even after the lectures. With the opening of the branch in Böblingen, ACONEXT is reinforcing its claim of providing innovative services in the field of technology consultancy close to the customer and off-campus. The company sees itself as a bridge builder between technology and development to build more efficient R&D processes in the automotive industry.